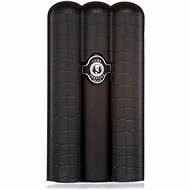 Eau de Toilette Cuba Magnum Black is purely men's fragrance with notes of tobacco and leather. 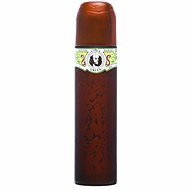 The bottle in the shape of a Cuban cigar is concealed in a stylish brown packaging. The original scent is suitable for men who love natural scents in their purest form. Due to special packaging and masculine scent, this eau de toilette suitable gift for any man. Composition tones fragrance is ingeniously constructed so different chords stand out beautifully. Notes of tobacco is finely blended with the fragrance of genuine leather. The whole composition underlines the strong foundation of this fragrance. Unique, very masculine scent is long lasting and is suitable for the evening, as well as for daily wear. This fragrance will last a long pleasant surrounding and will attract the attention of women. Surround yourself with interesting aromas and enjoy the attention of beautiful women! Notes of tobacco and leather. 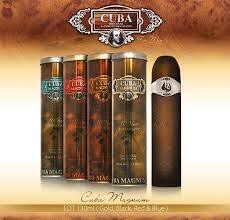 For shipping to other EU countries visit this page CUBA Magnum Black EdT 130 ml. Für Versand nach Deutschland, besuchen Sie bitte CUBA ba Magnum Black dT 130 ml. Chcete doručit zboží do Česka? 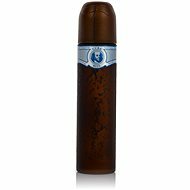 Prohlédněte si Cuba Magnum Black EdT 130 ml. Chcete doručiť tovar na Slovensko? Prezrite si CUBA Magnum Black EdT 130 ml. Für Versand nach Österreich, besuchen Sie bitte CUBA ba Magnum Black dT 130 ml. Magyarországra történő kiszállításért tekintse meg ezt a termékoldalt: CUBA Magnum Black EdT 130 ml.